1.9% APR APR financing for 72 months on new 2019 Q50 in retailer stock. $14.71 per month per $1,000 financed at 1.9% for 72 months, Down Payment may be required. Subject to Residency Restrictions. Subject to INFINITI Financial Services credit approval. Not all buyers qualify. Retailer sets actual price. Ends 04/30/2019. Are you shopping for an INFINITI in Morristown or Parsippany? 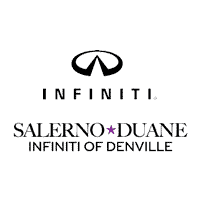 Visit Salerno Duane INFINITI of Denville located in Denville and a short drive for anyone looking for an INFINITI dealership in North New Jersey. We proudly serve our customers with an extensive selection of new and used vehicles. You can browse our vehicles online and select your favorite from a range of INFINITI sedans convertibles, crossovers, SUVs and hybrids. At Salerno Duane INFINITI of Denville, we want to make sure our customers get the right car and the best after-sales service. Visit us today or give us a call at (973) 361-6700 and we will help you get started. Salerno Duane INFINITI of Denville’s service department is equipped with the latest diagnostic tools. Our skilled technicians ensure that your vehicle always runs like new. We also have an impressive stock of genuine parts. If we don’t have the part you’re looking for, we will find it for you. Feel free to schedule an appointment at the time that is best for you. Contact our service staff in Denville at (973) 361-7400, if you have questions! To ensure that your vehicle looks as good as new always, Salerno Duane INFINITI of Denville in Denville recommends using only genuine car parts. You can depend on us for that. We want to make your shopping experience easy, therefore we urge you to fill our parts request form, so that we can get you the component you need. Our technicians will help you select the right one and also assist with the installation.